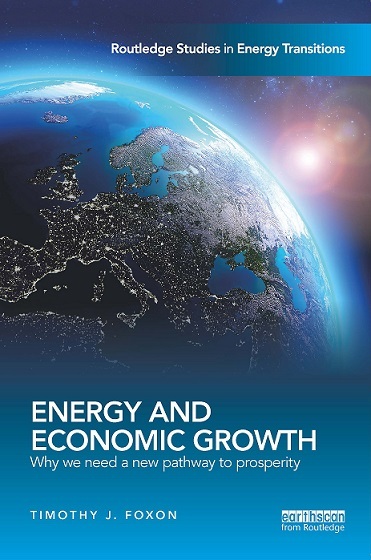 Thoughts and reflections on the launch of Tim Foxon‘s new book ‘Energy and Economic Growth: Why we need a new pathway to prosperity’. By Nora Blascsok. Students and faculty gathered together on 14 December to hear from Tim Foxon, Professor of Sustainability Transitions at SPRU and CIED, whose new book ‘Energy and Economic Growth: Why we need a new pathway to prosperity explores an important question: Do we need to move beyond an economic system predicated on growth to achieve a sustainable future? The book presents a historical perspective of the role of energy in driving economic growth. It grapples with the question of whether we need radical change to our economic system to create a sustainable future or whether investment in renewables will drive a new phase of “green growth”. The discussions at the event clearly demonstrated how divided the sustainability community is over answering this question. While everyone agreed that we need a positive approach, some were arguing for more radical changes to deal with the magnitude of the problem. Having been at SPRU for the past 3 years, this book has definitely helped all the ideas I have heard in seminars and lectures come together and suddenly make sense. 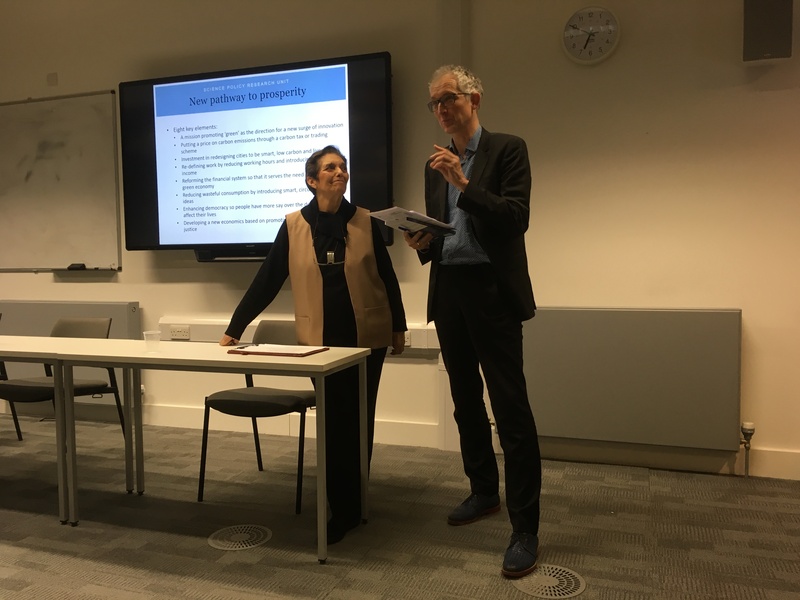 ‘This is a truly interdisciplinary book that brings together different strands of thinking’, said Professor Carlota Perez, the discussant at the event and who I interviewed briefly afterwards. What is unique about it, as Karoline Rogge, Senior Lecturer at CIED pointed out during the discussion, is the way it brings together the concept of techno-economic paradigm changes with ecological economics, which describes the way in which economies depend on flows of energy and materials to and from natural ecosystems. Ecological economics emphasizes the interdependence of the economy with natural ecosystems, as opposed to mainstream economic thinking which treats the environment as an externality. The book emphasises the way we should not only change where our energy comes from but the way we use it, increasing energy productivity. It also draws on Carlota Perez and Chris Freeman’s work on techno-economic paradigm changes. Carlota Perez, building on work by Freeman and Schumpeter, identified five surges of economic growth throughout history starting with the industrial revolution. Each surge has been driven by a set of technological and organisational innovations attracting financial investment that leads to a bubble and a crash. Then, after a recessive period, a growth era begins, with the full social benefits of the technology being realised when institutions have co-evolved to help realise them. The book proposes a dilemma: will a new surge of growth driven by investment in renewables, also known as “green growth” be the solution to our climate crisis or do we need to make more radical changes to our economic system and move to a post-growth economy, a system that focuses on delivering well-being rather than growth? ‘This is a very useful book. It is a condensed Bible of the energy and growth debate’ – said Carlota Perez. You could sense optimism in the room, which was partly filled with students studying on SPRU’s MSc programmes, including Energy Policy. They could be the future agents of change for the low carbon transition. The discussion after the lecture focused mostly on the ideas outlined by Prof Foxon on how to build a new pathway to prosperity, such as promoting green innovation, reducing working hours and introducing basic income, reducing wasteful consumption to move towards a circular economy and a way of measuring economic growth more focused on human wellbeing. However, Prof Foxon pointed out that the only politically feasible strategy at the moment is focusing on “green growth”, but we should at the same time be developing ideas for a “post-growth” economy. ‘Without growth, we are not going to improve the lives of the great majority, but we need to redefine what we mean by growth’– said Carlota Perez. We also have to remember that the low carbon transition is not only about technology; people play a key role too. As Prof Foxon emphasised: ‘It is important that people come together and keep the pressure on politicians and on industry to move faster towards a low carbon transition’. I was certainly left with a lot of questions but also a sense of enthusiasm and curiosity. We have a big challenge ahead of us, but I felt that the people in the room were ready to rise to it. Nora Blascsok is Communications and Engagement Officer for CIED. Tim Foxon will be posting a further blog about his new book in the New Year. The book is available from Routledge. Find out more about Tim Foxon and his work at CIED.